Although SO(10) Supersymmetric (SUSY) Grand Unification Theories (GUTs) are very attractive for neutrino mass and mixing, it is often quite difficult to achieve successful leptogenesis from the lightest right-handed neutrino N 1 due to the strong relations between neutrino and up-type quark Yukawa couplings. We show that in a realistic model these constraints are relaxed, making N 1 leptogenesis viable. To illustrate this, we calculate the baryon asymmetry of the Universe Y B from flavoured N 1 leptogenesis in a recently proposed Δ(27) × SO(10) SUSY GUT. The flavoured Boltzmann equations are solved numerically, and comparison with the observed Y B places constraints on the allowed values of right-handed neutrino masses and neutrino Yukawa couplings. The flavoured SO(10) SUSY GUT is not only fairly complete and predictive in the lepton sector, but can also explain the BAU through leptogenesis with natural values in the lepton sector albeit with some tuning in the quark sector. A.D. Sakharov, Violation of CP invariance, c asymmetry and baryon asymmetry of the universe, Pisma Zh. Eksp. Teor. Fiz. 5 (1967) 32 [JETP Lett. 5 (1967) 24] [Sov. Phys. Usp. 34 (1991) 392] [Usp. Fiz. Nauk 161 (1991) 61] [INSPIRE]. Planck collaboration, P.A.R. Ade et al., Planck 2015 results. XIII. Cosmological parameters, Astron. Astrophys. 594 (2016) A13 [arXiv:1502.01589] [INSPIRE]. W. Buchmüller and M. Plümacher, CP asymmetry in Majorana neutrino decays, Phys. Lett. B 431 (1998) 354 [hep-ph/9710460] [INSPIRE]. W. Buchmüller, P. Di Bari and M. Plümacher, Cosmic microwave background, matter-antimatter asymmetry and neutrino masses, Nucl. Phys. B 643 (2002) 367 [Erratum ibid. B 793 (2008) 362] [hep-ph/0205349] [INSPIRE]. G.F. Giudice, A. Notari, M. Raidal, A. Riotto and A. Strumia, Towards a complete theory of thermal leptogenesis in the SM and MSSM, Nucl. Phys. B 685 (2004) 89 [hep-ph/0310123] [INSPIRE]. A. Abada, S. Davidson, A. Ibarra, F.-X. Josse-Michaux, M. Losada and A. Riotto, Flavour matters in leptogenesis, JHEP 09 (2006) 010 [hep-ph/0605281] [INSPIRE]. P. Minkowski, μ → eγ at a rate of one out of 109 muon decays?, Phys. Lett. B 67 (1977) 421 [INSPIRE]. P. Di Bari, Seesaw geometry and leptogenesis, Nucl. Phys. B 727 (2005) 318 [hep-ph/0502082] [INSPIRE]. A. Yu. Smirnov, Seesaw enhancement of lepton mixing, Phys. Rev. D 48 (1993) 3264 [hep-ph/9304205] [INSPIRE]. W. Buchmüller and M. Plümacher, Baryon asymmetry and neutrino mixing, Phys. Lett. B 389 (1996) 73 [hep-ph/9608308] [INSPIRE]. E. Nezri and J. Orloff, Neutrino oscillations versus leptogenesis in SO(10) models, JHEP 04 (2003) 020 [hep-ph/0004227] [INSPIRE]. F. Buccella, D. Falcone and F. Tramontano, Baryogenesis via leptogenesis in SO(10) models, Phys. Lett. B 524 (2002) 241 [hep-ph/0108172] [INSPIRE]. G.C. Branco, R. Gonzalez Felipe, F.R. Joaquim and M.N. Rebelo, Leptogenesis, CP-violation and neutrino data: what can we learn?, Nucl. Phys. B 640 (2002) 202 [hep-ph/0202030] [INSPIRE]. E.K. Akhmedov, M. Frigerio and A. Yu. Smirnov, Probing the seesaw mechanism with neutrino data and leptogenesis, JHEP 09 (2003) 021 [hep-ph/0305322] [INSPIRE]. I. de Medeiros Varzielas, S.F. King and G.G. Ross, Neutrino tri-bi-maximal mixing from a non-Abelian discrete family symmetry, Phys. Lett. B 648 (2007) 201 [hep-ph/0607045] [INSPIRE]. S.F. King and M. Malinsky, A 4 family symmetry and quark-lepton unification, Phys. Lett. B 645 (2007) 351 [hep-ph/0610250] [INSPIRE]. E. Ma, Neutrino mass matrix from Δ(27) symmetry, Mod. Phys. Lett. A 21 (2006) 1917 [hep-ph/0607056] [INSPIRE]. I. de Medeiros Varzielas, Neutrino tri-bi-maximal mixing from Δ(27), AIP Conf. Proc. 903 (2007) 397 [hep-ph/0610351] [INSPIRE]. I. de Medeiros Varzielas, Family symmetries and the origin of fermion masses and mixings, arXiv:0801.2775 [INSPIRE]. S. Dimopoulos and F. Wilczek, Incomplete multiplets in supersymmetric unified models, NSF-ITP-82-07, (1981). K.S. Babu and S.M. 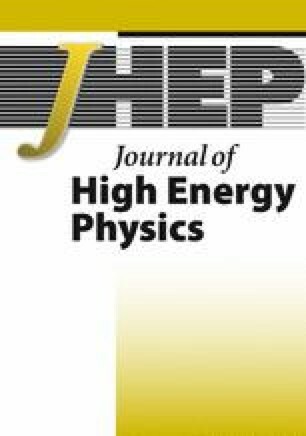 Barr, Natural suppression of Higgsino mediated proton decay in supersymmetric SO(10), Phys. Rev. D 48 (1993) 5354 [hep-ph/9306242] [INSPIRE]. S.M. Barr and S. Raby, Minimal SO(10) unification, Phys. Rev. Lett. 79 (1997) 4748 [hep-ph/9705366] [INSPIRE]. S.F. King, Predicting neutrino parameters from SO(3) family symmetry and quark-lepton unification, JHEP 08 (2005) 105 [hep-ph/0506297] [INSPIRE]. I. de Medeiros Varzielas and G.G. Ross, SU(3) family symmetry and neutrino bi-tri-maximal mixing, Nucl. Phys. B 733 (2006) 31 [hep-ph/0507176] [INSPIRE]. S.F. King, Invariant see-saw models and sequential dominance, Nucl. Phys. B 786 (2007) 52 [hep-ph/0610239] [INSPIRE]. I. de Medeiros Varzielas, Neutrino tri-bi-maximal mixing through sequential dominance, arXiv:0804.0015 [INSPIRE]. S. Antusch, S.F. King and A. Riotto, Flavour-dependent leptogenesis with sequential dominance, JCAP 11 (2006) 011 [hep-ph/0609038] [INSPIRE]. 1.School of Physics and AstronomyUniversity of SouthamptonSouthamptonU.K.